I stole this fabulous appetizer recipe from my niece. It is so easy and delectable! Brown 1-lb sausage, mix with a package of cream cheese and a can of Rotel and crockpot on low for two hours. Serve with tortilla chips. My boys just die over it. Speaking of my boys and delectable. I pilfered that word from my nine-year old, Stockton. He tells me dinner is delectable if it's good or digestible if it's not! He's such a funny kid I decided to base the little boy in my new Christmas book, Oh, Come On - Be Faithful, off of him. I don't normally use real people for characters, but it just fit perfectly to pattern it after my happy, redheaded boy who changes the words to every Christmas song. You can buy Oh, Come On - Be Faithful on Amazon for only $2.99 or if you're a prime member, borrow for free. Former Army security expert Matt Degan is in desperate need of a Christmas miracle. His ex-wife cleaned out his savings account and abandoned their son. Sadly, he has no presents stashed. When he finds a job as a bodyguard for Mikayla Lambert, a billionaire heiress who has been tormented by a stalker for four years, he’s caught up in family drama that threatens this beautiful woman he’s becoming enamored with and might also endanger his son. Can Matt protect everyone and save Christmas for his son, or will the stalker succeed at kidnapping Mikayla and destroying any chance at love between them? 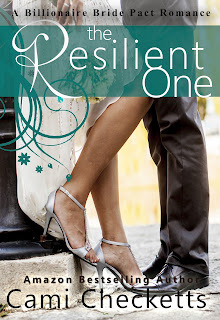 I'm also thrilled to announce the release of my first Billionaire Bride Pact book, The Resilient One. I'm writing this series with my amazing friend, Jeanette Lewis, who came up with the idea of twelve friends making a pact at summer camp to marry only billionaires or they'd have to sing the humiliating Camp Wallakee song at their wedding without telling anyone why. Jeanette's book, The Passionate One, is also available now.